Split and griddle the individual ciabatta rolls until lightly charred and toasted. To make the chickpea crush, first soak the onion in cold water for 15 minutes and drain well. Place the chickpeas in a roasting tin, drizzle over the oil, season well with black pepper and place in the oven for 15 minutes. Place roasted chickpeas in a bowl and gently crush with a potato masher. Stir in the remaining ingredients and season to taste. To make the chorizo and prawns, simply heat a large frying pan and fry off the chorizo for 5 minutes until golden and all the oil has oozed out. Remove the chorizo from the pan and set to one side. Turn up the heat and toss through the prawns and tomatoes over a very high heat for a few minutes or until the prawns are just cooked through. Add a good glug of sherry and flame. Season to taste. 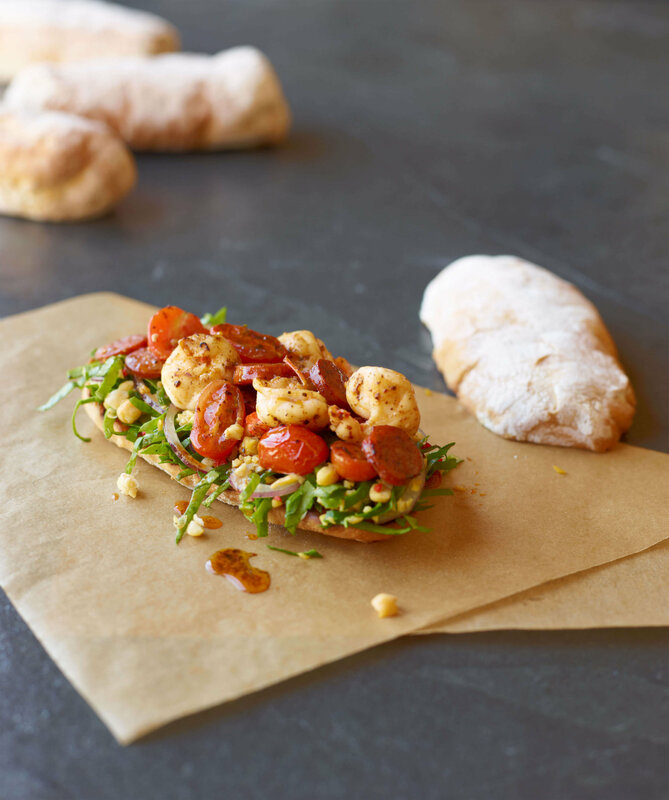 To serve, spoon the chickpea crush on each ciabatta half and top with the warm chorizo & prawn salad. Place remaining ciabatta half on top and serve straight away.